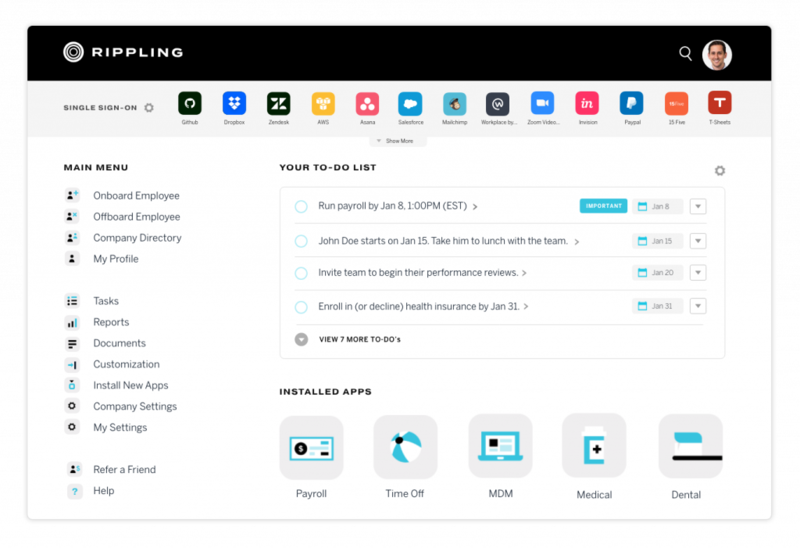 Rippling has raised its Series A investment round, led by Mamoon Hamid from Kleiner Perkins, with participation from existing investors Initialized Capital, Threshold Ventures (formerly DFJ Venture), Y Combinator, and others. The round includes $45 million in new capital. Kleiner Perkins was probably the only VC firm I could have named when I was in high school, and I’m thrilled to be able to call them an investor in my new company. I’ve known Mamoon since 2013, and have wanted to work with him for years. I’m excited to have him join Rippling’s board of directors, along with Prasanna and myself, and Ilya Fushman as a board observer. Mamoon and Ilya have played a critical role in building some of the Valley’s iconic SaaS businesses, and I look forward to having them on the team. Rippling solves an unsexy problem I’ve been passionate about for a long time — the administrative pain of disconnected business systems, and the accompanying grind of managing information about employees in hundreds of different places. Most people think of employee data as an HR problem — but we’ve found that information about employees is scattered across almost all of a company’s departments and systems. On the most basic level, each of these systems needs to maintain employees’ login credentials to authenticate their access; many systems well outside of HR also need to know an employee’s department, role, manager, or level within the organization. Rippling is the first employee system that works across the entire company — not just HR. We call this an Employee Management System to distinguish it from traditional payroll and HRIS, because Rippling integrates broadly across the entire company to automate wide swaths of administrative work. This is particularly critical for IT. A great deal of the daily administrative work performed by IT professionals is ultimately about controlling access — who should have access to what systems and software within your company? How should those users be configured within those systems? What level of permissions should they have? Those questions are, in turn, really about ‘who are your employees?’ and ‘what is their role or level or function in your organization, and therefore what type of access do they need to do their job?’ These are fundamentally questions about the employee record. By tightly integrating HR and IT together, we can free up time for businesses by eliminating most of the administrative work it takes to onboard, manage, and offboard employees. For example, when you hire someone in Rippling, we take care of their payroll, benefits, and new-hire paperwork in seconds — but we can also ship them a preconfigured computer, set up their keycard access, and even create their user account in all of the cloud apps your company uses, like GSuite, Slack, Github, and Dropbox. 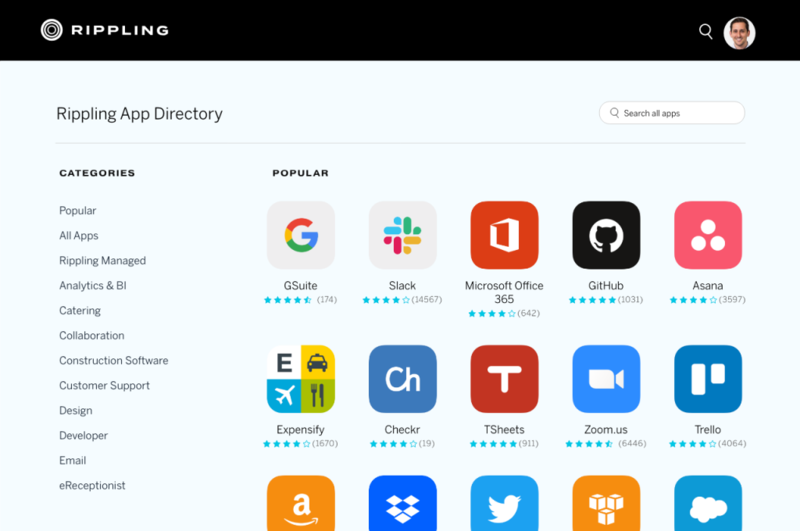 In fact, Rippling integrates with over 500 different apps, from Salesforce to AWS — something no other HR system can claim. Fundraising, of course, is not an accomplishment in and of itself, but it is a rare and humbling moment of outside affirmation that we’re on the right track. This financing will help us double down on product and engineering, build out the G&A infrastructure of our company, and continue down the path ahead. The best way to understand Rippling is to see it—we encourage you to get a demo of the product here.